Tattoos are now permitted, so long as not on the face or throat, however they cannot be lewd or hateful. Black denim jeans are now acceptable for your barista to wear. A small nose stud is now okay. Shirts no longer have to be tucked in. There’s much more, but those are some of the major changes. The changes officially go into effect on Monday, October 20, 2014. Just my two cents, but I suspect that we might still see very isolated, rare exceptions that will not follow this new dress code. I’m guessing that it’s possible that high-profile concept stores such as the Roastery or stores that have a unique partnership with other businesses (such as the Downtown Disney Starbucks) may set their own elevated dress code. 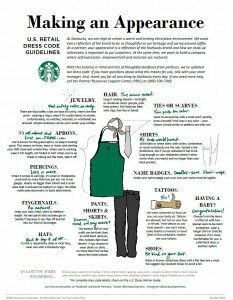 Again, I’m making a wild guess (and could be wrong), and would still assume that the dress code as described above will cover 99.99% of the stores you visit in the U.S.
About one month ago, major news sites reported that Starbucks was re-evaluating their dress code. Now we have the official Starbucks new dress code. Let me know what you think! Please feel free to weigh in. I’d love to hear your thoughts. such an exciting announcement! And even us Canadian partners will reap these rewards, according to Twitter responses to inquiries! I’m so happy to hear this!! Being a tattooed person myself, I can now apply as a second job to work at a sbux and be myself… This is awesome. I like it. It’s about time. Some of the training videos that come through show baristas with uncovered tatoos and other dress code “violations”. I’m ok with the black jeans, too, although I find my work pants cost less than black jeans. I just woks non-slip work shoes were required and not just “highly suggested”. I’ve helped many a barista up off the floor after a slip in their regular shoes. My comment is that we are right next to a Wal Mart and non-slip shoes are cheaper than breaking a body part. The only change I have a problem with is with rings. That’s telling me I’ll no longer be able to wearing my engagement or wedding band, both have stones. This actually makes me uncomfortable. I made a decision earlier in the year to ALWAYS wear my rings, due to problems with male customers. I’m not sure what to think…why is this all of a sudden becoming an issue now. I’m surprised you were ever allowed to wear your rings, our local health department prohibits jewelry of all kinds, except a plain wedding band, for all food workers. I suppose you could always just buy a little plain band for your ring finger! Courtney – This should not be a new policy – it is standard food handling regulations. Any food service worker is required to abide by these rooms, or else they are violating heath codes. This is generally true for the no nail polish rule as well; it is banned by most health codes. Most Starbucks do not care about rings and allow it. Especially wedding bands and etc. That’s actually the only exception to the national dress code with the food industry. So I don’t think you’ll get in any trouble with having that on your finger especially if you’re getting flirted with by most male customers. I’m very uncomfortable as well doing this. It’s apparently a QASA violation now.. BS. I’d rather cover my tattoos back up. Tattoo a ring on ;P Lol ! You should be able to wear a ring wrapper, that way you can still wear your ring! No watches makes me really sad. During the busy morning with two partners on register I have no way to actually tell time, we have no clocks in Starbucks beyond someone getting off the register. Now I can’t use my phone or a watch? That makes me really sad. While I’m happy for the changes, I am concerned about the jewelry. No watch? I’m a new shift supervisor, and find it difficult to run breaks when I don’t know what time it is. Plus I use my engagement ring as my wedding band… I get the food safety concern, but it’s not an issue in my state, why has it become company policy? I think it’s cool baristas won’t have to wear arm bands or long sleeved shirts to cover up tattoos now! I do think a tucked in shirt looks nice though! The 2 questionable new rules for me are, 1-no rings that have stones in them. I would have to quit. I take my wedding ring off for no one. This is a symbol of the commitment between my husband and myself. There are lots of food service employees that wear just their wedding rings. 2-no bracelets. I have worn two bracelets for the past 10 years, never have I had to take them off, even for TSA or surgery. One is a medical IDS bracelet, it has life saving information on it if I were ever in an accident! The other is engraved with my son in law’s information on it from when he was killed in action. SSgt Kyle A Eggers, US Army. Neither of these have been off my arm and I don’t have any plans to do so. I am probably not the only person on the earth that wears either one of these. Their must be exceptions! When a partner is pregnant, she didn’t have to tuck her shirt in….exception. Personally, I don’t want to see a lot of earrings, tatoos or gauges, but I can get over those things. But……… Thanks for letting me rant! I’m so excited that I don’t have to cover up my tattoos, especially with the contrary “No Bracelets/ Watches”… Totally understandable, to an extent… But my time management will slack since I can’t have my phone on me, either. Also, I wish they’d allow an eyebrow piercing since we can now have nose studs and gauges (to a certain size). Nose studs are a religious exception. They were facing a lawsuit on that one…. I’m not a partner but as a short-waisted person I am very much in favor of the untucked shirt. To the ladies who want to wear their wedding rings and engagement rings……. If you want to send a message to customers that you are in a relationship, I understand that! But…. You are also advertising that you can easily become a victim to a criminal in a robbery. Whether you are working or heading to and from the job whether by car or Public Transportation, there is always the possibility that somebody is waiting for the right moment to take it from you. If people will steal your smartphone, they will try to steal your jewelry and rings. Forget the policy! Be smart….. Don’t advertise! Would you rather send a message to customers, or be heartbroken when your rings are taken? My wife stopped wearing her rings to work and shopping years ago. She had many situations where she felt something wasn’t right. Now she only wears them around family and formal parties. Sorry for the rant! Maybe I’m just getting too old. I am offended, Why have a wedding ring if you can’t wear it? Some of us never take ours off, to say just get a band for work is rediculous, and a watch unsanitary? Since when do you use your wrist to make a drink? I wear a waterproof watch so I don’t ruin it washing dishes so it gets washed a lot. You know, this is a good point. I don’t even have a huge flashy ring, but I’ve had people I know are casing it, because they have made comments about it. Besides the jeans, all codes that we’re broken constantly at my store, lol, stool a good thing though. For the partners I am glad for the changes. That being said I feel that these new dress codes will not be enforced after a month or so and as is now partners will wear whatever they want. Of course, this varies from store to store. I have seen partners take the standard dress code and vary it to their liking. I’ll commend Starbucks for establishing a dress code that this grumpy old man can mostly agree with. Unfortunately some will still push the envelope. The issue of the nose stud being a religious issue is a red herring and Starbucks’ Lawyers had better be ready to defend against the face and throat tattoos and wild hair colors as religious. I bring this up not to create controversy, but just as a heads up and to illustrate the extent to which people are abusing Constitutional Rights and our Legal System. Although it’s unclear to me (google didn’t turn up anything more recent) as to how that worked out. I am very pleased with everything that came out yesterday. 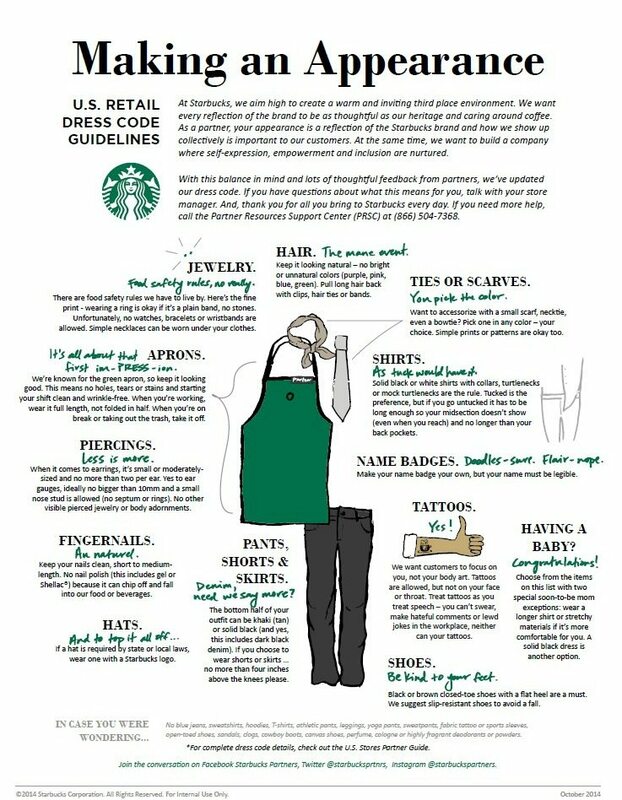 So much more than just the dress code, and I’m happy that Starbucks really, carefully considered our feedback and came back with reasonable changes. I become prouder every day that I am a partner. I’m hoping on Monday they also give us more information… can the Khakis be denim as well? Does your undershirt still have to be the same color as the over-shirt? There are little details that are still missing. I think there was a lot of hype about the denim, tattoos and piercings. And the hair thing is not a new policy. I don’t understand fussing over that. Do you know how much more money you save by not dying your hair all the time? (This coming from a barista that used to have pink/plurple/blue/green hair at Barnes and Noble). One thing I had hopes for is an exception to having unnatural hair color. I feel that our people are about as unlikely to be offended by hair color, as they are tattoos. I express myself through my hair, and I don’t see any reasons as to why we’re prohibited from unnatural hair colors, other than preference. I understand that it can be perceived as being “unprofessional,” but the experience we strive to provide for our customers should be based on quality service, not on what they think about my hair color. This is the first time as a partner I am so completely mad about something our great company has changed. For the past almost 5 years I have tucked my shirt in everyday and never had a tattoo showing on my arms. But today I’m asked to take my wedding ring off… As many partners are so excited to un tuck their shirts, show tattoos and have a stud in their nose. Are you kidding me? Are you really kidding me? I will not remove my wedding ring. I will not enforce it. My entire team knows this will not be enforced and if we are marked down in an audit, then so be it. I could call the PRSC say I cannot remove it due to religious reasons, maybe a broad range of calls like that may help, but I don’t intend to make that call. If we are moving dress code ‘forward’ to match our image, which apparently is denim wearing, untucked shirt, nose stud teenager image. I believe we have lost a professional touch, but for years, wedding rings have been a non-issue. To be honest, I don’t have any problems with the new standards, even the watch piece, yea, it’s really lame, I am so used to operating by my wristwatch, but this no ring issue. Because the ring issue is also one of a stone, not the ring itself (I’m sure the company is thinking about stones falling out into drinks, but honestly, earrings and piercings can fall out, nothing in this world is perfect, and if someone’s diamond falls out of an engagement or wedding band they are going to notice) I’d go as far as to argue that this policy is discriminatory towards women. I am NOT saying that the policy was created in order to discriminate towards women. But I AM saying that it IS discrimination. Men’s wedding bands do not often have stones, and when I have seen stones in them, they’re more often an inlaid ring, versus the protruding stone on a traditional woman’s ring. The inlaid rings are going to be much more easily considered dress code ok. Point being, this policy discriminates against women, and that’s not ok.
As far as rings, wedding or otherwise, and watches, I’ve always been skeeved out by the fact that we would allow them – not food safe!! Yuck! I understand partners wishing to wear them, and the reluctance of some partners to take them off, but that doesn’t change the fact that stones can fall out, and more importantly, the little crevices in ring surfaces can harbour bacteria. Food safety trumps partner desires every time, like it or not. And the reality is, things change. I will not be told by a partner that it ‘used to be allowed, therefore it’s OK’. We also used to allow bandaids to cover tattoos, and that’s been ruled out for food safety reasons as well. Things change – we need to roll with it 🙂 And the huge boost in morale this gave my team? I am down with it! Some of these new rules just shock me. I have worn my watch to work for over 7 years now. Never have lost a stone out of it, I never touch it while working, wash it regularly because it’s waterproof (and of course ALWAYS shut off the water with a papertowel – I notice a lot of partners that don’t.) I think they’re going to need to put clocks on the floor or I’m going to have to have one nearby as many of the tasks are time driven – duh, a watch would be necessary…I can see everyone on the floor wearing timers now.. (smh). As for the rings rule, I can understand about not wearing too many (or oversized)…but asking someone to not wear their wedding ring/s because of stones is getting a bit extreme. My husband has never removed his wedding ring (ever) and as for myself it only comes off for cleanings (not anymore thanks to my new work rules and having diamonds in both bands now is a ridiculous call. I can understand if the Mastrenas were machines that could catch your ring and rip your finger off but…they are not and if you are properly washing your hands then they ring is therefore also being washed. Is the company going to buy everyone a plain band to wear out of choice to state that they are married, engaged, etc. because they have to remove their stone filled rings? – also ridiculous…a rhetorical question of course.) I don’t mind the tattoo rule because I work with many partners that have them (almost all are very tastefully done) and think the dark black denim pants rule was a long time coming…I cannot tell you how many partners have got away with wearing yoga pants at my store because they don’t like slacks. I have seen some partners with extremely large guages (not sure what they’ll do about that – but not my problem.) Oh well…on one hand people are happy about the tats and piercings and on the other being told they cannot have their wedding vows honored. From this change in the dress code and the discussions here (some passionate) I sense that Starbucks may be setting their stores up for full food safety compliance and carding/certificating/licensing all employees as Food Handlers. This would allow Starbucks to do a lot more with food items. My two cents on the ring issue. While my wife and I view our rings as a symbol of our commitment (40 years and counting), we both often wear our rings on chains around our necks. Our love and commitment is more than a ring on a finger. I got in that habit when I was in the Navy and working around machinery and my wife is a Registered Nurse and an RN who is concerned about their patients never wears her/his ring while on duty. Not just common sense, but actually the law in most states. While its true that we work in food service, we don’t do food prep. We aren’t allowed bare hand contact. If we did those things, I could understand the ring policy. I would sooner wear a glove on my hand for every shift than remove my ring. I’m not a cook, I’m not a surgeon. If my hands aren’t authorized to touch any food items, why do the rings on them matter? The removal of wedding rings is a problem for me. Married thirty years, my ring no longer comes off because of my knuckles. To remove it means I would have to cut it off. This personal inconvenience aside, I agree with all the pro-ring comments. The net, for 42 years rings have not been a problem – why now? We do not stick our hands into anything but dishwater. It’s complete BS my fiancé isn’t allowed to wear her engagement ring to work. What kind of message is this sending? If the problem is that crevices in rings may catch food particles or germs then wedding bands may be next to go since many bands are engraved or have laser cut designs to reflect light or make them more appealing to the buyer. These “crevices” in bands may also catch food particles/germs -so out they go?? Simple answer seems to be if you handle food wear gloves. What I personally find bad is the nail rules. As well as the ring and watch rule. I feel like if partners are able to show tattoos…then shouldn’t women be allowed to accessorize with their wedding rings or bands? And as for the nails chopping and falling into drinks. 1. Nail polish does not chip that easily. 2.eyelashes can drop …. some male partners have facial hair… that can maybe lose a hair that may end up in a drink. The nail thing is directly pointing to women… which personally I feel is unfair, since a lot of work is done with poor hands wouldn’t it make sense for them to look presentable? I realize that I am really late to this article… but just had to comment about this. I know a Barista that got FIRED from Starbucks after 7 YEARS because of her tattoos! Her Store Manager told her that she did not want to get rid of her, but that the District Manager demanded her to because she didn’t like her tattoos. When she started there she was only in her teens. I would LOVE to tell this District Mgr how many times I have NOT been able to drink my coffee because of a handful Baristas that have their long bangs hanging too close for comfort over my drink while they are making it… personally think that is a LOT worse then seeing some tattoos! Those Baristas work very, very hard for very little. So kudus to Starbucks for relaxing their dress code and permitting them to be individuals. Frankly hope they relax it even more.